For millennia, cultures around the world opened minds and expanded visions with "plant teachers" what we commonly know now as psychedelics. Can we use psychedelics to heal ? Can we use them to connect, evolve ? Join us in October for the Evolver Intensives tele-seminar "The Future of Psychedelics : Exploring Their Potential for Insight and Healing." This series consists of four calls with some of the world's leading researchers and historians in consciousness-expanding medicines: Graham Hancock, author of the best-selling Fingerprints of the Gods and Supernatural; psychedelics researcher and pioneer, Rick Doblin, Ph.D., director of Multidisciplinary Association for Psychedelic Studies (MAPS); spiritual teacher Satyen Raja; and Amanda Feilding, director of the Beckley Foundation, the leading British research institution focusing on the science of drug use and the nature of consciousness. 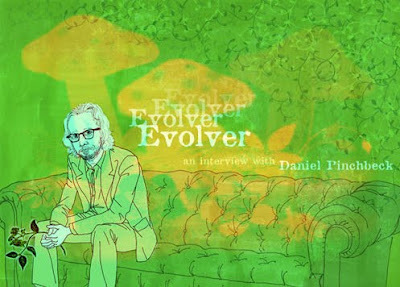 We invite you to join our host Daniel Pinchbeck for an extraordinary series of live, in-depth conversations. Go beneath the surface and take part in the kind of learning encounter you cannot find in the mainstream media. At this critical time in history, when the limitations of our consciousness are suffocating our creativity and joy with the refuse generated by our short-sightedness, what if we could go back to the source to open up new possibilities -- first in our minds, then in the world around us? For centuries, indeed for millennia, cultures have used naturally occurring psychedelic plants to free themselves from limited vision, limited ego, physical ailments and the cycles of suffering and recrimination that doom people to closed-end systems of unintended destruction. What if there was another way? These are just some a few of the fascinating topics we will be exploring in this Tele-Class Series with an extraordinary faculty ! "The first 2 people who email us here at [email protected] will get this series for free." " We have our 2 winners ... Otis Funkmeyer and Aaron Dietrich ! Wish all have an evolving experience and share the learning with all of us and see it grow ... Thank You All ... Stay Tuned ! "